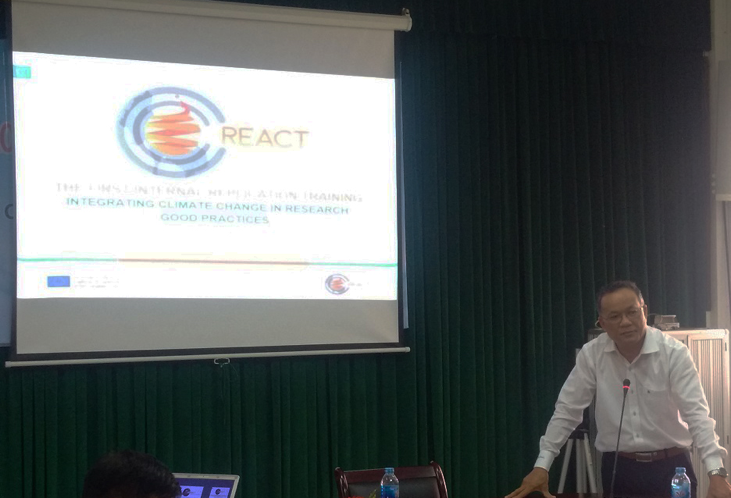 REACT Internal Replication Training at Hue University of Agriculture and Forestry "Integrating Climate Change in Research: Good Practices"
Home > News > REACT Internal Replication Training at Hue University of Agriculture and Forestry "Integrating Climate Change in Research: Good Practices"
The main aim of the meeting that took place at Hue University of Agriculture and Forestry (Vietnam), was to give an opportunity for those who are carrying out research and studying in the field of climate change at HUAF have a more systematic and pragmatic vision, working together better in developing, implementing and monitoring the works. The training attracted 15 MSc students, professors and researchers in the fields of climate change, representing all HUAF institutions and MSc students, who interested in the replicated topic. The following topics were addressed: Climate Change in research (Dr. Ngo Tung Duc), Mapping and engagement strategies for stakeholders (Ms. Le Thi Thuy Hang) and Interdisciplinary research and research groups (Dr. Pham Huu Ty). At the training, the presenters described the situation of climate change studies, identifying strengths, weaknesses and limitations, suggesting solutions to overcome and develop and giving typical examples. The participants commented and discussed on the topics actively.